Time: 1 hrs. 45 mins. The False Kiva trail leads to a Class II archaeological site in the Island in the Sky District of Canyonlands National Park near Moab, Utah. The picturesque site has been made famous by several pictures on the internet that include night time photos and passing thunderstorms. 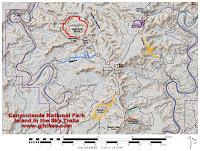 Class II archaeological sites are open to the general public but because of their fragile nature they normally don't show up on park maps and when they do have an official trailhead they usually aren't marked. 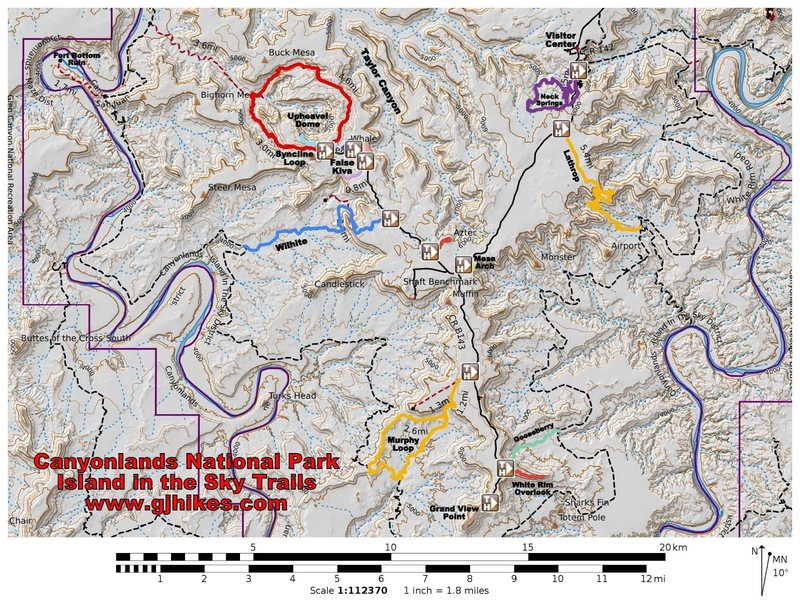 Park rangers are allowed to provide information about the site when they are asked. 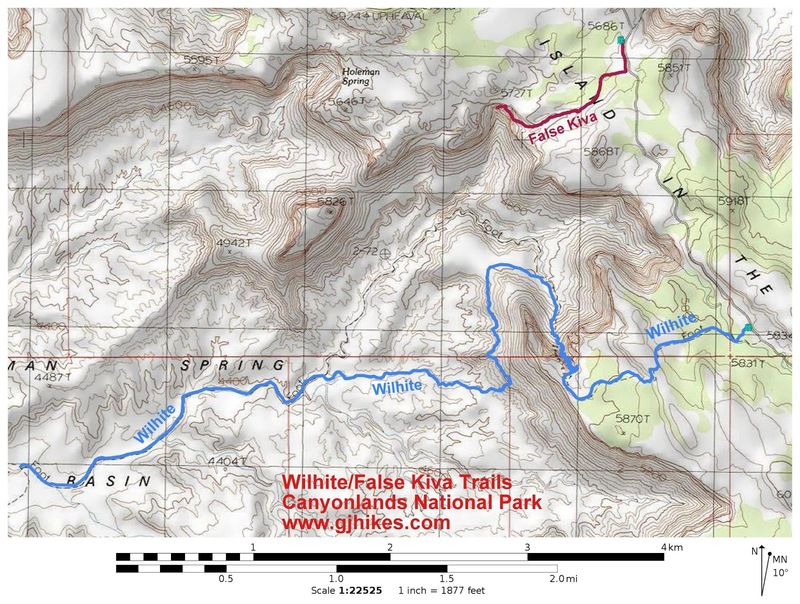 The closest trailhead and parking area to the False Kiva trail is a little over 1000 feet away at the Alcove Spring trail. No other parking is allowed along the narrow road so hikers may have to wait for a spot to open up when the pullout is full. Fortunately there are lots of other places to hike in the meantime. From the Alcove Spring trailhead hike back to the south along the road until reaching the bend in the road that is lined with juniper logs. Be careful not to leave the road until you have come all the way to the logs and found the well worn trail. 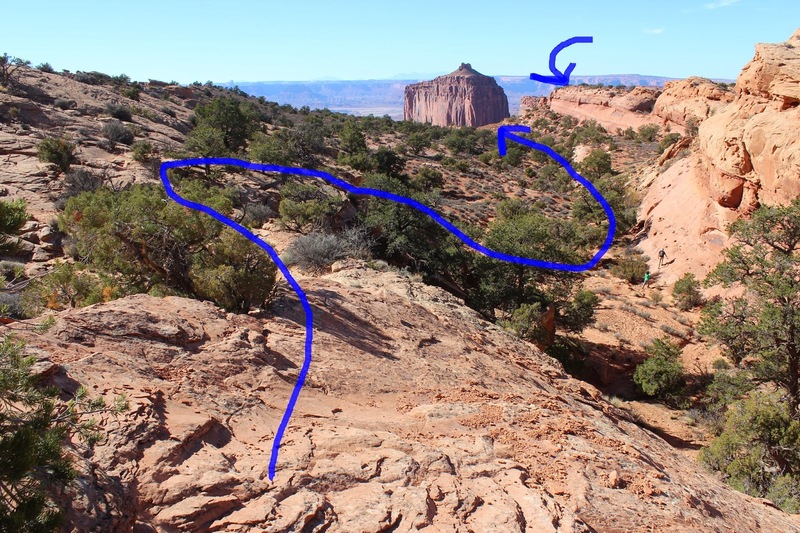 Making spurious trails all over the place degrades the landscape and the ecstatics of the area as well as really confusing other hikers. The obvious route is well worn and mostly follows the natural drainage. 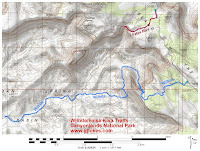 The trail routes around a spillover to get down to the next level of the canyon. Cairns mark the most popular and easiest ways over the slickrock. Once down at the next level continue following the drainage toward the rim. The alcove that houses the False Kiva is in the side of the cliff that faces southwest toward the white rim area above the Green River and doesn't come into view until you are much closer. 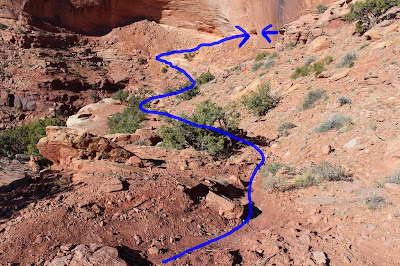 As the trail comes nearer to the rim of the canyon the angle of descent becomes steeper. 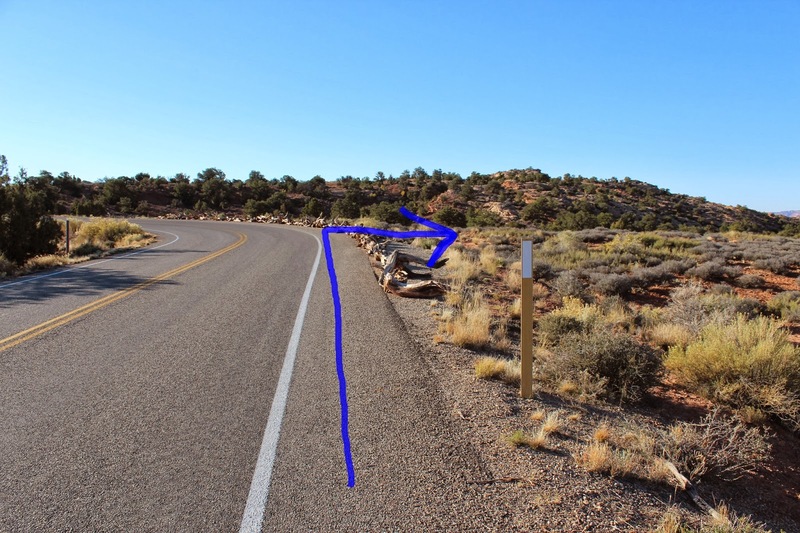 The first appearances of the trail, or seemingly lack of it, from this spot may cause you to question the thought of proceeding any further. In actuality the amount of danger from falling here is minimal other than stubbing your toe and doing a face plant. The trail is much more protected than it looks. If you try this when there is snow on the trail or during a heavy rain then you will have the usual problems that those present. In this photo the alcove that contains the False Kiva can barely be glimpsed. And, of course, there is the incredible scenery that is typical of Canyonlands. The prominent monolith off in the distant is called Candlestick. 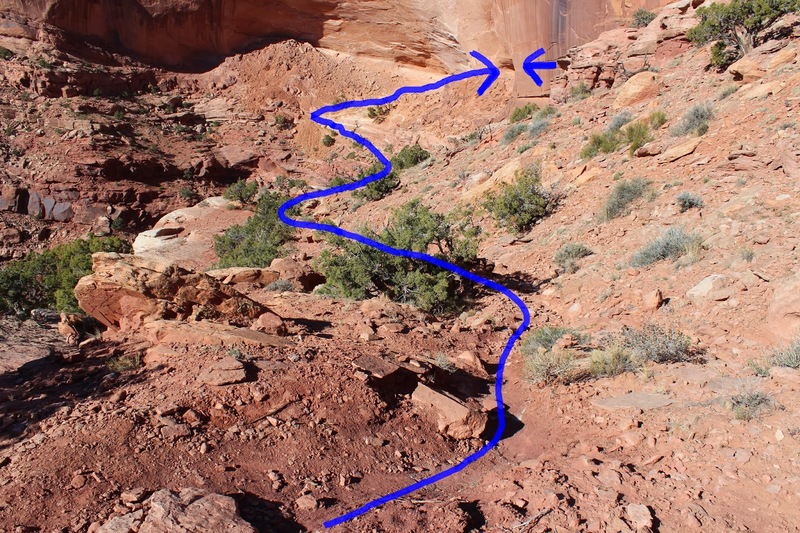 The section of trail below the alcove looks a little risky from above but it turns out to be plenty wide and set back very comfortably from any precipitous drops. 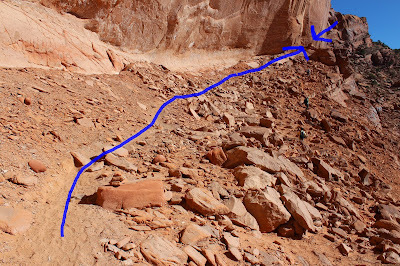 For the easiest route on the final stretch plot a high line up near the cliff where the trail is much smoother. The other hikers in this photo are taking a lower route where there are a lot of rocks to stumble over. Remarkably, the kiva alcove is still hidden from view at this point and it is less that 50 yards away. The best and safest route into the alcove is over the ridge right next to the cliff. Besides the circle of rocks known as the False Kiva there are other areas of interest within the alcove. The site is much more fragile than it looks. Visitors should be very careful not to sit, lean, walk on, or touch the walls in any way. Don't enter any of the roped off areas or any of the structures. At least one of them is known to contain a burial and should be treated with great respect. There are a couple of painted hand pictographs on the back wall of the alcove as well as a few other images that are no longer discernible. Words can't describe the scene any better than the picture already does. 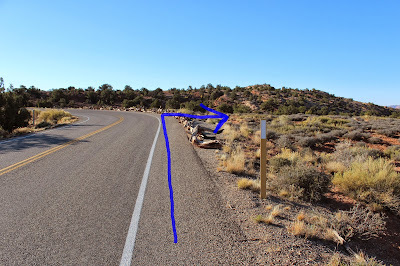 One of the Park Rangers mentioned that it is illegal to enter the circle of rocks. There isn't a sign that mentions that so it is unclear how visitors are supposed to automatically know that. Many sites at other locations, such as Chaco Canyon for one, direct visitors through kivas, pueblos and other structures as part of their tours and have signs where they don't want you to go. A few of those signs would be very helpful here. Also of interest is a boulder near the west end of the alcove that looks like it was used as a metate for grinding seeds. One other boulder has deep grooves cut into it that probably represent canyons or rivers. Hopefully the slideshow has enough photos for you to know what you are getting into before attempting the False Kiva hike. The majority of visitors that come to the Island in the Sky District will want to forgo it. The Park Service keeps a close eye on this site but they can always use more help. Be sure to report any vandalism or suspicious activity immediately and treat the site with the same respect that you would give to any place that is special or sacred to you. If you would like to see it for yourself then all you have to do is 'Take a hike'.